This is my home-made Lukcy Green Rice! I have created it with crushed pyrite, lodestone, iron filings, essential oils and bits of real cash! Rice is a symbol of wealth and luxury in many cultures around the world. Lucky Green Hoodoo Rice is used to bring wealth, prosperity, good luck, business success in spells, bottles and mojo bags. Sprinkle around your place of business and in your cash register to bring an added boost to sales. With the front door closed stand outside and throw a small handful of rice at the door to attract good luck, money and prosperity. 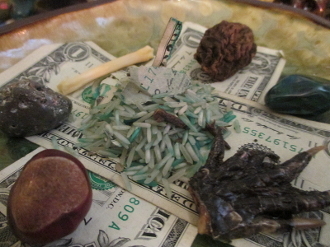 You can also put some of the rice in your wallet or purse to attract money. If you want good news or if you are expecting money through the mail place some in your mailbox. Put some rice on the telephone receiver to bring good news. Sprinkle some under door mats or place some of the rice in an open container near the front door. Take a small handful of the rice and throw it on the roof business to attract customers who are willing to spend their money with you. You can also place some under door mats at the main entrance. Place some rice in places where money is kept like the safe, the cash register and inside money bags. You can also place some rice in an open container near the main entrance. Place some on the telephone to bring profitable business calls or scatter it in your parking lot. Add it to money work and mojo bags. Put a few grains in potted plants around the home or office. Put a few grains in your wallet or the pocket of your purse. Throw at your own front door, then sweep it up and spread it over the yard or (for apartment dwellers) into the driveway or parking lot. Use as a starter for a money pot. Men should dress a little bit of lucky green rice with John the Conqueror oil and ladies should use a little rosemary oil, depending on who wants to control the finances. Put a little in the pantry to attract grocery money: To make it work long and steady, wrap a dollar bill facing out around a nice cinnamon stick, hold that in the center of a small tin can (the little tomato paste cans are perfectly sized for this) then pour the rice around the stick.